Pistol grip disc sanders, grip sanders. Three sanders shown below have threaded male spindles, but the disc nut covers that spindle in the photo. These three threaded spindle sanders use backing pads for the different spindle sizes shown on the Pads for discs with center holes page. 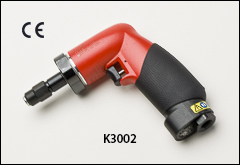 The collet on the K3002 sander can be used with the quick-change backing pads shown on the 2" and 3" QC pads page. For additional sanders, please see our DA, random orbital , Inline sander , Palm sanders , and Right angle sanders pages. Sioux Signature Series trigger start sander with a down-handle exhaust and comfortable grip. 3 jaw collet, 30 CFM @ 90 PSI, 1/4" air inlet, 3/8" hose, 4.4" long, 1.7 lbs, 77 dB(A). Sioux Force aluminum housing, lockoff lever throttle and built-in speed regulator. Air regulating screw in tool handle. Includes one 3" and one 4.5" backing pad. 12 CFM (30 CFM max) @ 90 PSI, 1/4" air inlet, 3/8" min hose, 4.3" long, 2.2 lbs. St. Louis Pneumatic 0.50 HP lightweight design provides comfort and control. High-speed performance for general and touch-up sanding. 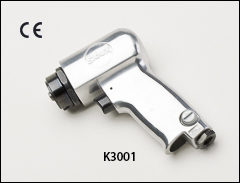 Regulated speed control and through-handle exhaust. Includes 3" and 5" backing pads and a hub nut with a wrench. Lower prices are available for 10 and 25 tool orders. WARNING: Proposition 65 Label for K2000 . 6 CFM @ 90 PSI, 1/4" air inlet, 3/8" min hose size, 5.25" long, 2.5 lbs. Sioux Signature Series trigger start sander with a down-handle exhaust and comfortable grip. Includes one 3" and 5" backing disc, one disc retaining hub nut, and wrench. 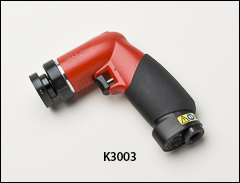 30 CFM @ 90 PSI, 1/4" air inlet, 3/8" min hose size, 4.4" long, 1.7 lbs, 77 dB(A).